Finished in 2011, CAMA's sawmill exhibit houses an operating American #1 sawmill. This is a fully functioning sawmill that we use to cut wood at our shows and for projects at CAMA. 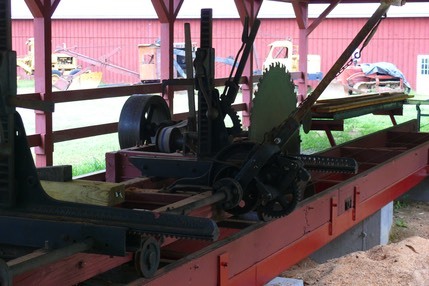 Housed in an open-sided shelter, this antique American #1 sawmill is powered by a McCormick-Deering gasoline engine. 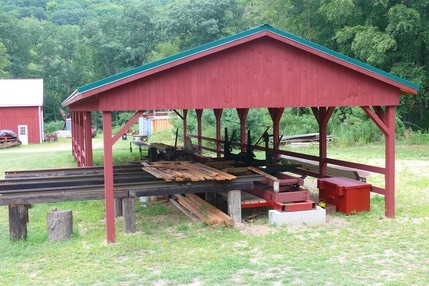 Demonstrations of the sawmill occur during our shows or by special appointment. The sawmill is at the heart of a growing collection of wood handling and finishing machinery, including a large planer, drag-saws and a two station wood-splitter.